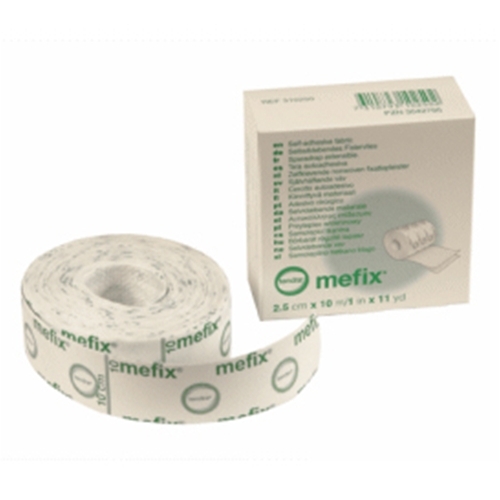 Mefix Adhesive Dressing Tape from HealthyKin.com is made of a porous, polyester elastic non woven coated with a skin- friendly polyacrylate adhesive providing secure fixation. It is protected by an easy-to-remove, pre measured release liner. The porous structure of the non woven fabric ensures air and water vapour permeability. The fabric is flexible, confirms well to body contours, and allows body movements when in place. The fabric is non-absorbent and provides a barrier for blood and fluid strike-through. Best skin tape! Doesn't irritate skin, flexible, use it for wound care with dressing and contours to the affected area. Stays on all day and is easily removed. Great product. Great product for use with the infusion sets of an insulin pump. Used Mefix for 25 years now. Great product. Great Service. I have to change my dressing gauze daily. This tape doesn't irritate my skin at all and sticks very well. Great for tender skin applications. Also easy to use. Good product. Best tape for the skin. Used by the wound care center I visited. Fast delivery, but shipping cost is a little high. Perfect for the job but seemed to ttake longer than other products to ship. Generally happy. Very good! Won't break you out.